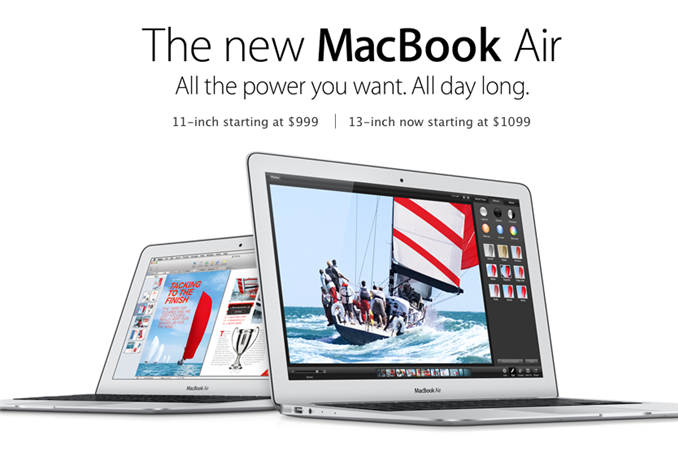 This morning Apple updated its MacBook Air to Intel's Haswell ULT silicon. The chassis itself didn't get any updates, nor did the displays. Both the 11 and 13 inch models retain their non-Retina 1366 x 768 and 1440 x 900 displays. There's a slight increase in battery capacity. The 11-inch model moves to 38Wh (8.6%) while the 13-inch model goes to 54.4Wh (8.8%). The big changes however are on the CPU, NAND and DRAM fronts. The 1.8GHz i5 in the 13-inch ended up being a bit quicker than the 1.3GHz 4250U this generation in the multithreaded test, but in single threaded performance the two are equal. The impact on the MT test is about 5%, it's there but not substantial. Don't be fooled by base clock, it's the combination of base clock, max turbo and cooling solution that'll determine performance here. As we found in our Haswell ULT review, CPU performance isn't something you can expect to see more of with Haswell vs. Ivy Bridge in these low wattage platforms. 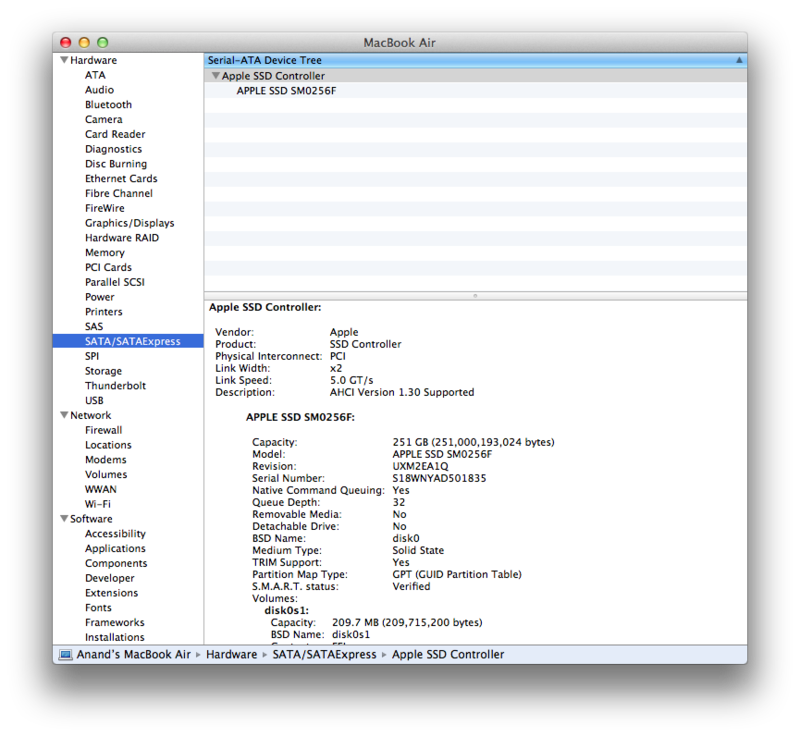 You can get a 1.7GHz Core i7 upgrade with a 3.3GHz max turbo (i7-4650U). 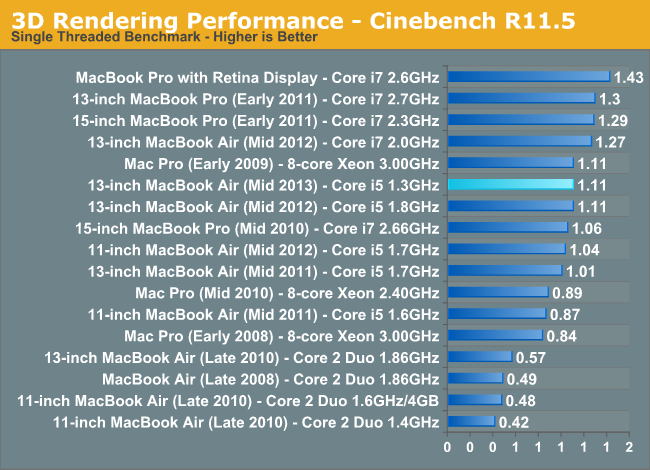 Both parts have Intel GT3 graphics clocked at a max of 1GHz on the i5 and 1.1GHz on the i7. Since the max GPU clocks are south of 1.2GHz, this is officially Intel's HD 5000 graphics and not Iris despite using the same silicon. The GPU base clock drops from 350MHz down to 200MHz, which should help reduce idle power consumption. 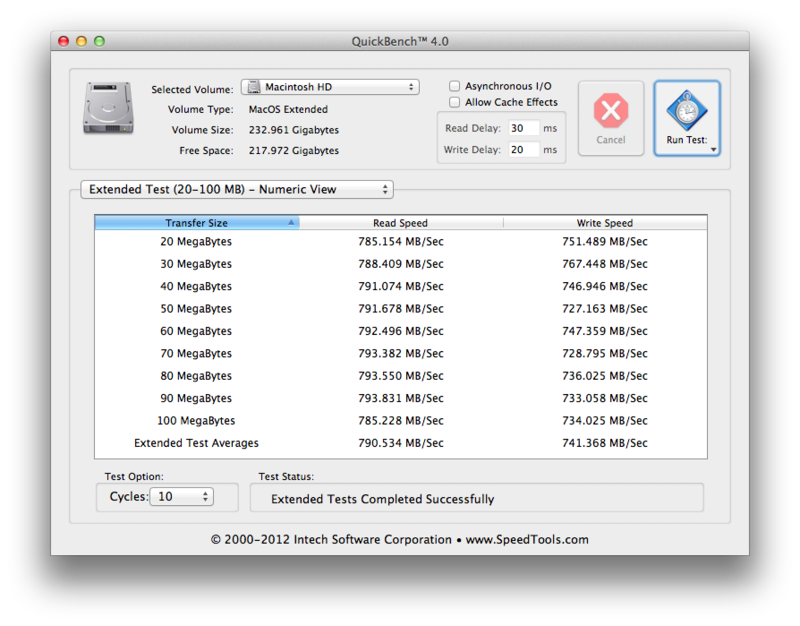 On the storage front, Apple officially leads the charge with the move to PCIe based SSDs. The upcoming Mac Pro, as well as the new MacBook Airs both use PCIe based SSDs instead of SATA drives. 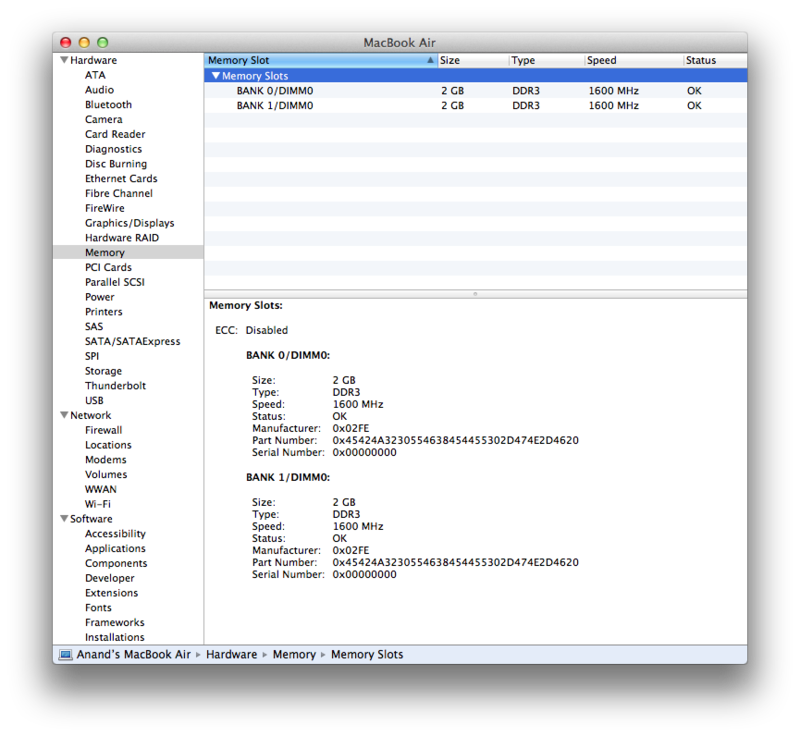 A quick look at OS X's system profiler reveals a PCIe 2.0 x2 interface, capable of 1GB/s in each direction. This is a pretty big deal, as it is probably the first step towards PCIe storage in a mainstream consumer device that we've seen. I'm still awaiting official confirmation as to whether or not this is an M.2 based solution or a proprietary connector. Update: It's a custom Apple design, not M.2. Since there's no PCIe routed off of the CPU in Haswell ULT, these 2 lanes come from the on-package PCH. The other big change is the move from DDR3L to LPDDR3, a new feature supported by Haswell ULT. I need to go back and dig through the Haswell ULT datasheets again, but I believe the total memory interface width remains at 128-bits wide even if you use LPDDR3 - you just get lower power consumption. 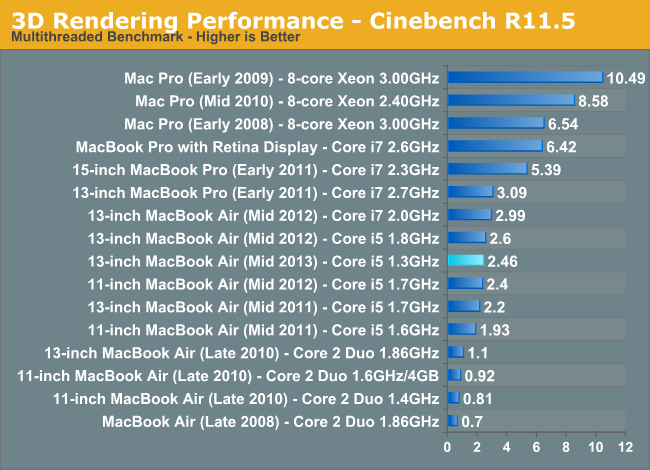 Obviously battery life is the biggest improvement here with the new MacBook Air. Thanks to Haswell's platform power optimizations, Apple claims up to 12 hours on a single charge for the 2013 13-inch MacBook Air. Given the improvements I saw in our Haswell ULT review, I don't doubt that we could see some very good numbers out of these notebooks. I just got my hands on a 13-inch 2013 MBA and I'll be running performance tests (including the first look at Intel's HD 5000 graphics) over the coming days. I'm still traveling until Thursday but I'll do my best to run battery life tests while I'm on the road as well. More soon! The MBA didn't have "all day" battery life and this new model probably won't have either, unless you spend that day processing word on lowest brightness with WiFi turned off. The IB 13-incher returned 5-6 hours if you actually used it as a computer on the go, with high brightness to counter reflections, WiFi turned on with a less than optimal connection and lots of websurfing (including battery eaters like Youtube) and a multitasking workload. The new model will probably shoot at 8-9 hours, coming closer to a workday away from an outlet. The 11-inch model will still have room to grow.